On the other hand, Bitcoin’s blockchain – The Blockchain – is unique and different precisely because it’s not centralized. It’s not owned by a particular organization. Decentralized nature of The Blockchain is the main value proposition and its competitive advantage over its counterparts – private blockchains. The Blockchain is analogous to a public ledger that is transparent and tamper-proof, and it contains all the transactions that ever happened on its network. The Blockchain has a reward layer on top, which is the Bitcoin. This reward system makes it interesting for server farms to be a part of the ecosystem – to become third-party, independent bodies – who are willing to sync all the data that the blockchain has, and in return to get a reward in the form of Bitcoins. (As of today, it’s a $5+ billion worth industry) These are literally thousands of servers, also known as full nodes (5,084 nodes as of today). Besides getting paid for fulfilling transactions on the Blockchain, they also mine Bitcoins. How exactly they mine Bitcoins is a topic for a different blog post. Changing any confirmed past transaction in the blockchain is almost impossible. 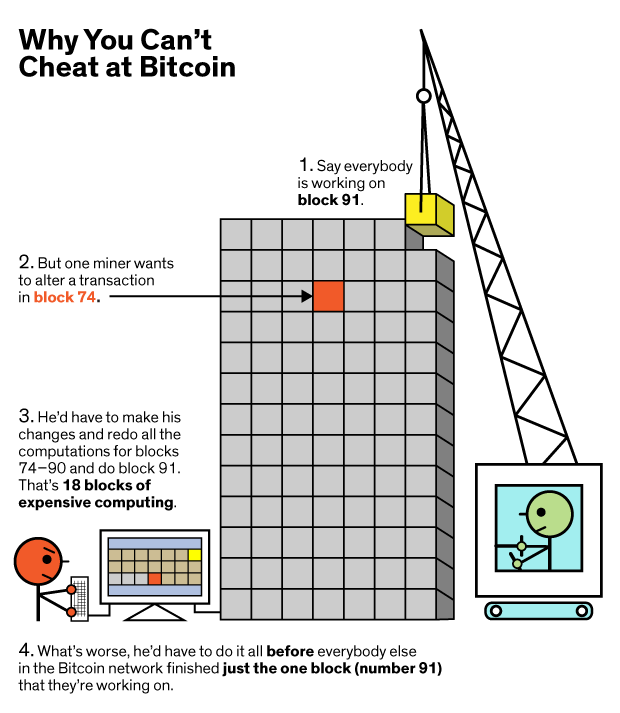 See the simplified illustration below or read the full article here in order to understand how the Bitcoin system works. It’s nearly tamper-proof, because there is still a tiny chance of being able to alter a transaction if you have enough processing power. And this is also known as 51% attack in the Bitcoin community.